Tonight's food is something I've wanted to try for several years. I'm a longtime fan of Rob Cockerham's excellent website, cockeyed.com, and he wrote a while back about attending a Miracle Fruit tasting party. The Miracle Fruit (Synsepalum dulcificum) is a berry native to Africa which, when eaten, coats your tongue and makes sour and bitter foods taste sweet. How? This is the best part - nobody really knows! There is a protein called miraculin found in the berries which scientists think bonds temporarily to your taste buds and changes the way that they perceive certain flavors. Miracle! 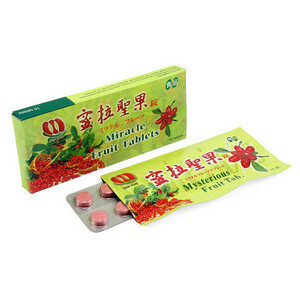 The berries themselves are really expensive to transport, and perish quickly, so the easiest way for most people to try them is in the form of handily packaged tablets, which I've shown a picture of here, and which I had on hand for tonight's party. Although I had some vague ideas about other things that I wanted to eat during the course of Project Gastronome, this was the one that I absolutely knew had to be on the menu. And since the minimum order is a package of 10, I knew that I had to share this experience with some friends! Thus was born the idea of the Project Gastronome Wrap Party. Since most of you have never eaten a holiday meal at my house, you probably don't know how bad I am at judging food quantities. I make enough of everything to serve more people than will be coming, and the result is a very bountiful table with plenty of leftovers. Here's what we had to sample from tonight. I handed out the tablets, and we all had a laugh at how much it felt like we were about to take pills together. The first one is always free, friends. The tablets themselves were very tart. I think the general consensus was that they tasted like those natural fruit Fruit Roll Ups or like sugarless Sweet Tarts. And then the tasting began! I'm still thinking of the best way to describe the experience of eating these things. I think we all approached the table with suspicion, because once you've finished the tablet your mouth doesn't really feel any different. But as we started eating, it quickly became evident that something very unusual was happening on our tongues. Apple cider vinegar went down with a little burn (it's still vinegar, after all) but tasted like sweet nectar! Lemons were not sour at all, they were like sunshine-flavored candy! Grapefruit had no bite at all, just explosive sweetness! The citrus really was the most interesting part, but the rest was interesting, too. They didn't taste substantially different, but still noticeably different. Sour dill pickles tasted like sweet bread 'n butter pickles. The sour candies just tasted like ordinary gummy candies. The dried cranberries tasted kind of like raisins, and the dark chocolate wasn't bitter - it tasted almost like milk chocolate. Wine was interesting; the bottle we had was a pretty good one, but after the tablets, it tasted like Boone's Farm. In about 30 minutes, the tablets began to wear off, and then things got even more interesting. People started to ask me if I had leftovers from any previous nights, so I pulled out the Baconnaise, gefiltefish, century eggs, ants, and natto. Nobody would touch the natto or gefiltefish. The Bassetts and Holly all tried some Baconnaise on crackers. Roy, John, and Jessica all tried ants. I think they were all surprised by just how hard it is to get all of the little pieces out of your mouth. And then John told me that he'd try some century egg if I would eat it with him. Of course I did it. I wasn't happy about it at all, but at least I knew what to expect. John was very close to blowing chunks all over my kitchen, I think. The evening was a great success. To each of you who came, thank you so much for being a part of it! Here's a little bit of video to give you a taste of the evening. Check back this weekend for a wrap-up of Project Gastronome! What a neat party idea! Not that i'd host one, but the attendees are sure to talk about it forever! Gold Stars for Roy and John, geez. And congratulations, Danny, on another inventive and highly entertaining project.